The centrifugal speed governor is a mechanical device to measure and control the speed of a machine by transforming the rotational speed to a mechanical displacement. A model is built and programmed using Lego WeDo to demonstrate the physics behind it. 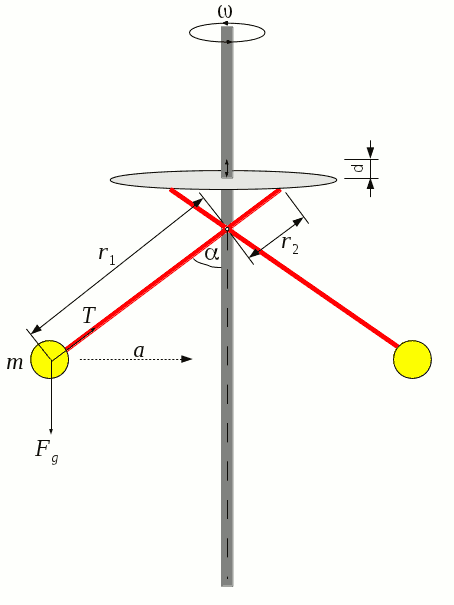 Two weights (yellow-red Lego blocks) are attached to a rotating axle like a pendulum. The faster the axle spins the bigger the angles between the axle and the attached weights become. Through a mechanism, this angles are transformed to a vertical displacement of the white platform. The faster the rotation, the bigger the angle and the lower the position of the platform. The platform could now be connected to a controlling device, like a valve. Systems like this were used since the 18th century as a mechanical “cruise control” for steam engines with the valve controlling the steam flow to the engine. The WeDo program used for the speed governor starts when the “A”-key is pressed. First, the number 10 is stored in the display and the motor set in motion at full speed (10). Jetzt startet eine 10-Fache Schlaufe. Bei jedem Durchlauf wird, nach einer Wartezeit von 100, eins vom Wert der Bildschirmvariablen abgezogen und diese als neue Motorgeschwindigkeit festgelegt. Dadurch wird der Motor bei jedem Durchgang etwas langsamer, bis er schliesslich ganz stehen bleibt. For ω smaller than specified by equation 6. The produced centrifugal force is not high enough to balance out the gravity. The arms of the governor will therefore not be lifted. On the left you see the material that is needed to build the speed governor. All the items can be found in the WeDo package.